A wonderful portrait of a true America (s)hero! A chapter of history that everyone should be taught. Well told story. Realistic portrayal of the times, especially on how society viewed what the role of women should be in the academic, social, and business world. 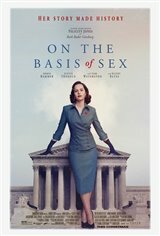 The movie effectively reflects RGG's transition from a supportive wife to a capable, self confident lawyer and jurist of extraordinary intelligence in the face of obstacles from many sources. Th factual portrayal is understated leading to a climax that is dramatically explosive as she fully asserts herself . The epilogue depicts her many accomplishments. I thoroughly enjoyed it. It was well acted. The script was well written. The choice of actors was superb and plausible. Unfortunately, I'm not sure the action adventure crowd will go for it. No explosions or wise cracks just a well told true story. Bravo! As far as movies go, it is well made with few if any flaws. This is unfortunate, because future generation will judge RBG by this movie. She is no heroine and does not deserve this kind of acclaim. Watch the CNN documentary on Ruth Bader Ginsburg. She accomplished more than so many in her lifetime. Ruth is no hero, in fact she represents everything that honest and moral people abhor. This movie is about steering a narrative.